Tuckfields Tea - Australia was and is known for their Tea and tea card issues. Approximately 7 series were issued from Tuckfield. One release has by far had more exposure than the others. That would be the birds issues. It's myriad versions were probably brought about by time and re-issuing. You will also find that other brand names appear with the same cards. Those brands are Copper Kettle coffee and Kinkara tea. Of course there are wild flowers; dogs; fish; cats and... well, just check the issues list below. The order of issues is not clear. It appears the cards started appearing in the 50's and in 1988, J. Lyons took over and merged it into another company. Then it looks like the cards continued to be issued after 1988, but some under the Tuckfield name and some not. Some reference books list the Birds series as c1960 and others c1970. Even though the Tuckfield name no longer graces the cards or albums, Sue Walter has shown us that the tea is still sold but the cards stopped in August of 2008 . The boxes of loose tea had cards in them whilst packets of tea bags had a swap token. Alan Moss from England pointed out that in the Birds series, out of the first 384 cards issued, only one card is displayed horizontally. I looked at the rest up to 480 and discovered that the one card is the only one for all birds issued. Which one is it that is horizontally displayed? It's card no. 9 "The Satin Bower Bird". Why is this one card vertically challenged? Good question. Thanks Alan! Good eye! Australiana Series Animals 32 1 to32 19?? Popular Dogs 32 1 to 32 19?? Australiana Series Birds * 32 1 to 32 19?? Australiana Series Birds (Reissue of 1st 32) 96 1 to 96 19?? Australiana Series Birds (Reissue of 1st 96) 192 1 to 192 19?? Australiana Series Birds (Reissue of 1st 192) 288 1 to 288 19?? Australiana Series Birds (Reissue of 1st 288) 384 1 to 384 19?? * - Australiana Series Birds was also known as Australiana Bird Studies and Australiana Bird Series. 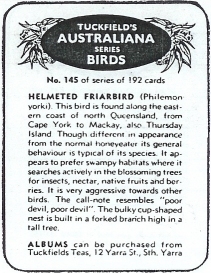 A Bird Card Series token was introduced after 1966 (Australia has converted from pounds to dollars according to the token). You could trade in the token for any card from 1 to 384. ● - This is based on a recollection of Sue Walter when she purchased a first edition fifth series album.